Health At Every Size® (HAES) is a movement that challenges the status-quo and argues that a shift towards weight-neutral health outcomes is needed. It is a weight-neutral approach that supports a holistic view of health and it acknowledges that health can’t be characterised simply by the absence of physical or mental illness. Contrary to popular practice and public health policy, HAES promotes the idea that a healthy weight for an individual cannot be determined by BMI, body fat percentage, or a number on the scale. 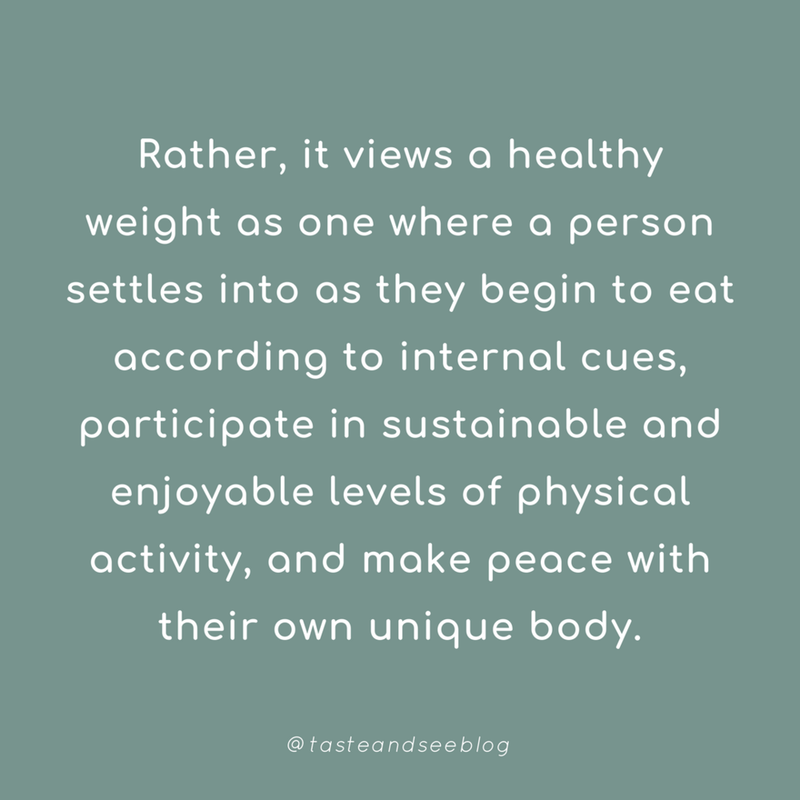 Rather, a healthy weight is defined as one where a person settles into as they begin to eat according to internal cues, participate in sustainable and enjoyable levels of physical activity, and make peace with their own unique body. The movement views the pursuit of health as neither a moral imperative nor an individual obligation, and that a person’s weight should never be used as a measure to judge, oppress, or determine the value of an individual. In contrast to traditional approaches to public health and medical care, HAES offers a compassionate and effective alternative that can result in the improvement of many so-called weight-related problems. 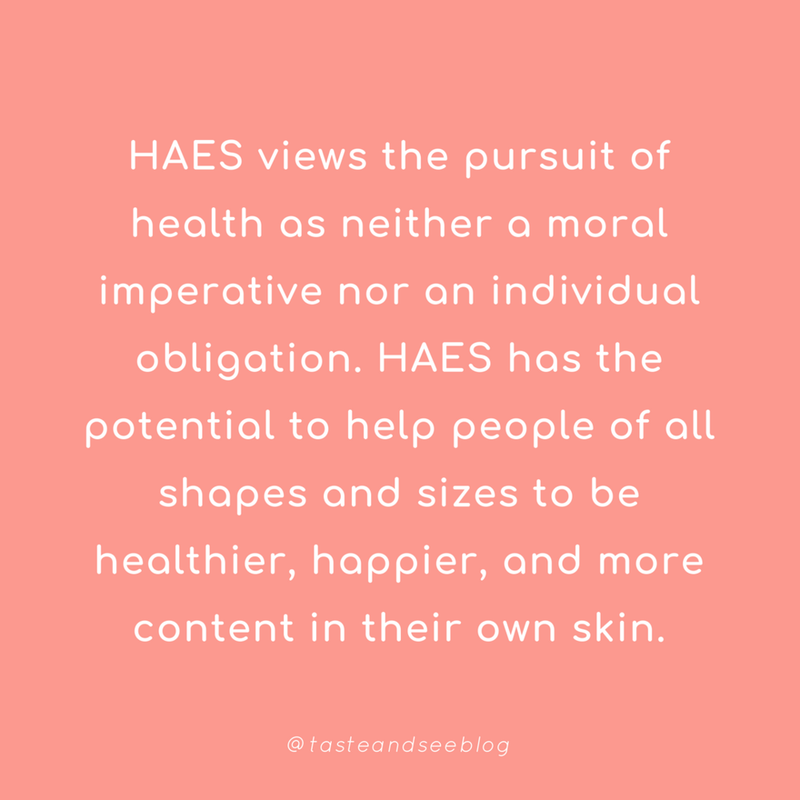 HAES doesn’t suggest that all individuals are currently at their healthiest weight, however it promotes movement toward an overall healthier lifestyle that will produce better health for an individual. It has the potential to help people of all shapes and sizes to be healthier, happier, and more content in their own skin. HAES does not imply that health risks and medical problems must be ignored, but it suggests that health professionals rethink approaches towards those in larger bodies rather than pushing weight-loss. 1. Weight Inclusivity - The HAES approach accepts and respects the diversity of body shapes and sizes that exist. It rejects the idea that specific body weights should be either idealised or pathologised. 2. Health Enhancement - HAES recognises that health and wellbeing are multi-dimensional. The paradigm supports health policies and interventions that aim to improve and equalise access to information and services, as well as personal practices that improve wellbeing including attention to individual physical, economic, social, spiritual, emotional, and other needs. 3. Respectful Care - HAES calls us to acknowledge our biases, and to work towards shutting down discrimination, stigma, and bias experienced due to a person’s weight. This principle includes promoting all aspects of health and wellbeing for people, providing information, services, and overall care from an understanding that socio-economic status, race, gender, sexual orientation, age, and other identities impact weight stigma. 4. Eating for Wellbeing - The HAES approach promotes flexible, individualised eating based on hunger, satiety, nutritional needs, and pleasure, rather than externally dictated eating plans and rules focused on weight control. 5. Life-Enhancing Movement - HAES promotes physical activities that allow people of all shapes, sizes, abilities, and interests to take part in and enjoy, to the degree that they choose. It promotes joyful movement rather than exercise with the goal of weight loss. What is the evidence for adopting a HAES approach? HAES is not ‘anti-weight loss’. If someone begins to honour their internal hunger and fullness cues, eat foods that are nourishing and make them feel great, move their body in a way that brings them joy, and take care of their mental and emotional wellbeing, and they lose weight, this isn’t seen as a bad thing. It just is - it is a neutral outcome of health-promoting behaviours, but doesn’t make the person who lost weight superior or ‘better’ than someone else who did the same things but maybe didn’t lose (as much) weight. Rather than focusing on the fact that weight was lost, this paradigm encourages this person to feel encouraged and empowered by the fact that they could improve health markers, mood, and find joyful ways to be active no matter what the outcome in terms of weight. HAES doesn't mean ‘healthy at every size’. Not everyone is as healthy as they can be at their current size. Some may need to gain weight to improve their health and wellbeing, whilst others may benefit from weight loss, BUT that doesn’t change the fact that there is no known, safe sustainable way for most people to achieve long-term weight loss. HAES is about promoting positive health changes that are sustainable and will improve quality of life in the long-term. Adopting a HAES/non-diet approach doesn't mean you’re ‘letting yourself go’. This assumption is based on the idea that if weight loss and dieting isn’t a primary goal, then you can’t care much for your health or respect your body. This couldn’t be further from the truth. HAES supports the idea that good health is multi-faceted, and isn’t based on merely on weight. It encourages letting go of short-term weight loss, diet cycling, and body dissatisfaction. Adopting a HAES approach isn’t ‘letting oneself go’, but rather it provides new measures of health such as feeling better overall, having more energy, sleeping better, improving strength, mobility, and fitness, improved moods, and feeling more normal around food. HBC Blogger Awards // I WON!